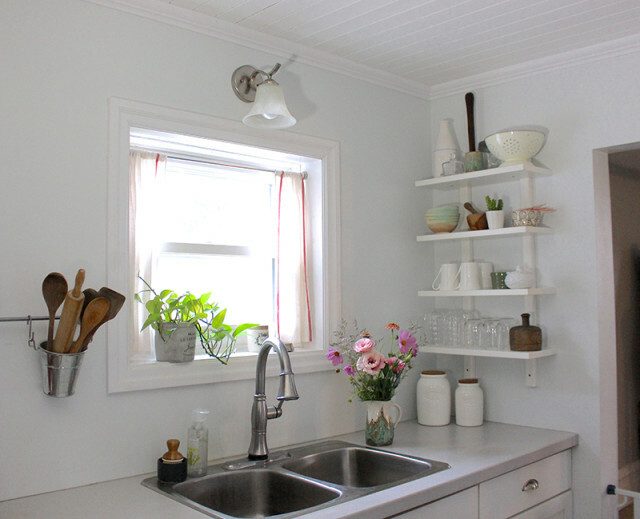 When we first moved into Cloverhill, I fell in love with our farmhouse kitchen. 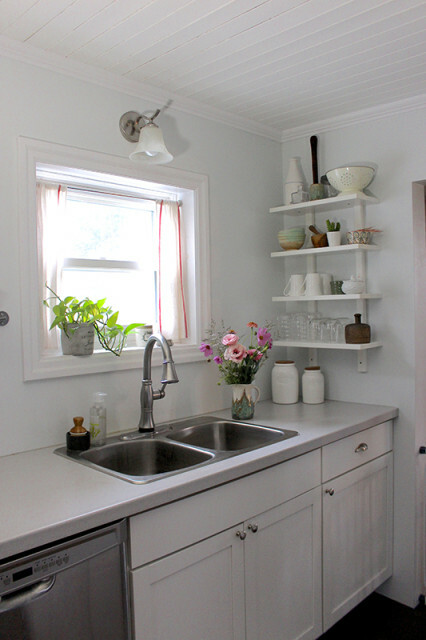 Unlike the kitchen in our previous apartment, this one was light and bright. 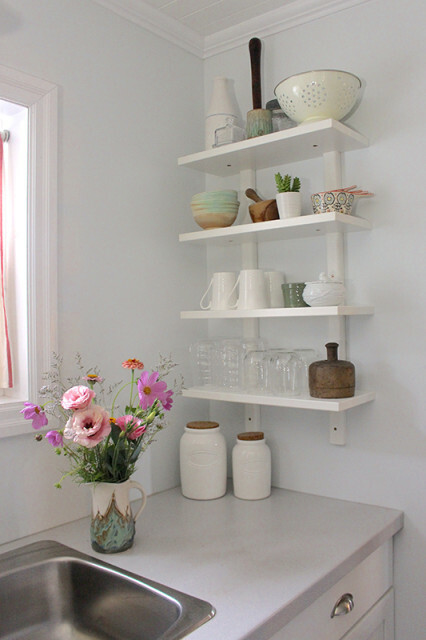 Part of what made it feel that way was the open shelves throughout the kitchen. Like many people who switch to open shelves, I was worried about dust on our dishes, but because we use the ones on our shelves all the time, they never got dusty. 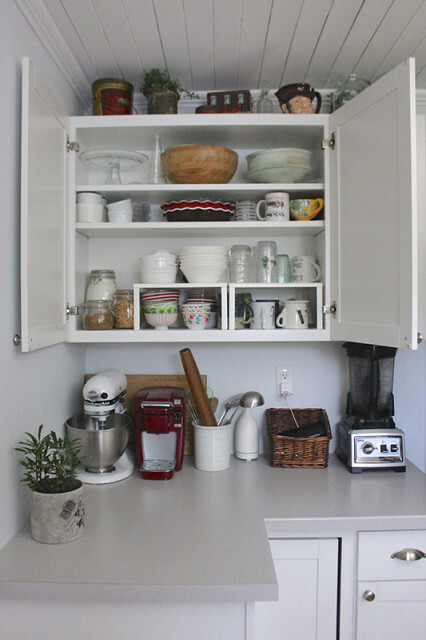 I also found ways to reorganize our kitchen so that the plates were in the drawers and not on the shelves. …it turned into total chaos. Now that Lucy is into everything we were finding it hard to have space to put things out of her reach, while still keeping the counters clear. That’s when we made the decision to go against everything you see in design magazines right now, and tear down some of our open shelves. Thankfully we were still able to get the Arcadian cabinets that the previous owners had installed. Garrett and my dad were able to swap them out in one evening. They pulled down the original shelving unit, and used heavy duty cabinet screws to secure the new cabinets to the wall. 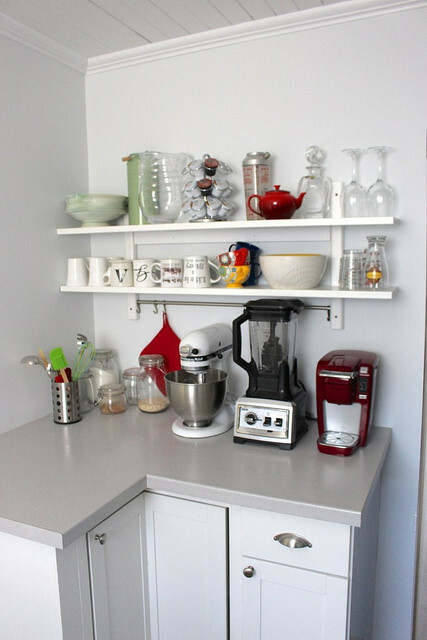 It instantly cleaned up the space and added so much storage. This corner is tucked behind the fridge, so it didn’t have any effect on the natural light. I didn’t want to lose my bright kitchen! The main cabinet holds our dishes and the small one to the right holds vitamins, medications and small pieces we want to keep away from tiny hands. I was able to make the shelves the height I needed for everything I wanted to put up there. I added some small metal shelves from IKEA to stack up the bowls, mugs and glasses, making the most of the space. 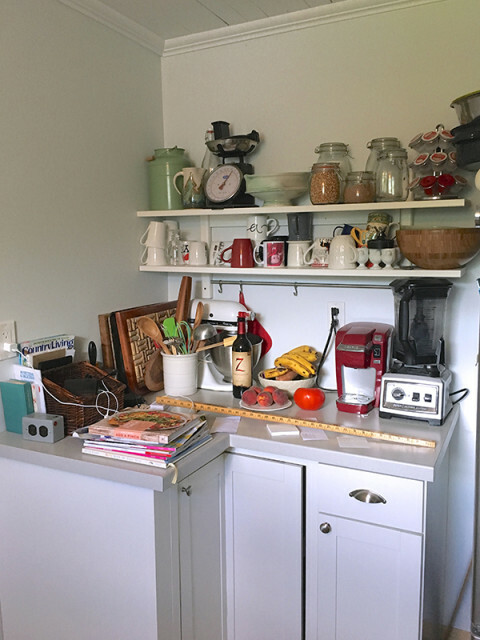 The little knick knacks on the top of the cabinet are there for a very good reason – they create an optical illusion. The counter is level and the new cabinet is level, but this 114 year old ceiling is not. Rather than mess around with the ceiling (which could mean lots of work and $$$), we opted to add a few pieces at the top that make the uneven lines look less noticeable. You probably wouldn’t even see it if I hadn’t said anything, but I wanted to share what I did in case someone else is dealing with a similar problem. I love the idea of swapping it out for holiday decor sometimes too! 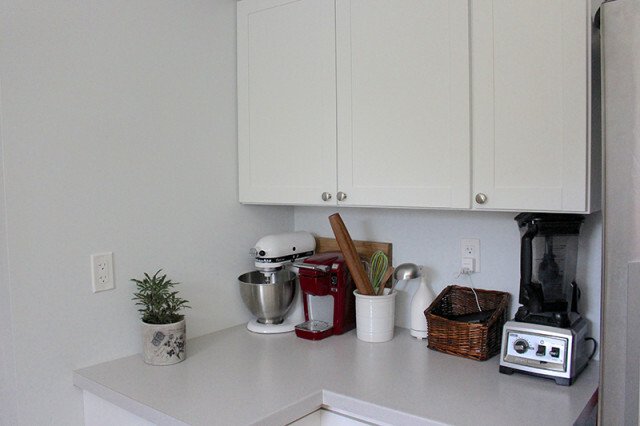 It really has helped us keep this counter space clear – everything has a place! 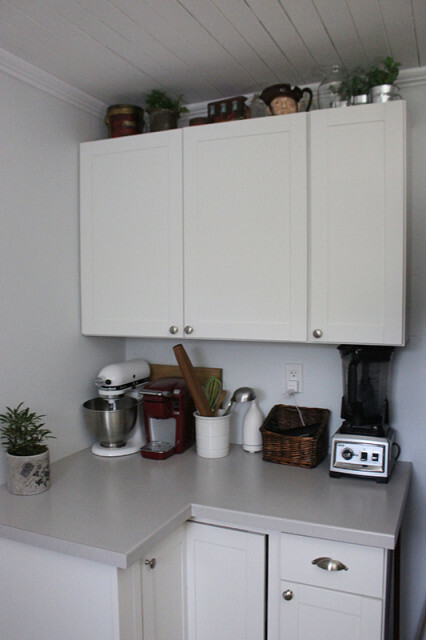 The cabinet is the perfect height to tuck our appliances underneath and we have plenty of counter workspace now. The small basket is our catchall for keys, sunglasses, lip balm, etc and works as a makeshift charging station for phones and the iPad. It also helps us keep the open shelves that we did keep nice and clean as well. They’re not getting cluttered anymore from things we’re trying to keep up. I’ve put our mismatched cups and mugs that I still love into the new cabinet and then our really nice matching ones are out on the shelves for company to use. Our kitchen is still an every evolving project as we figure out what works for us and what doesn’t. What we needed when we were a newlywed couple versus what we need as a family is very different, and I’m sure it will continue to change!